Just earlier this month on September 13th, Joyce Meyer released her new book entitled “Seize The Day.” As it seems to be the case more and more every form of a distributor that can distribute anything seemingly “Christian” is jumping on the bandwagon of this nomenclature of sub-Christian literate. 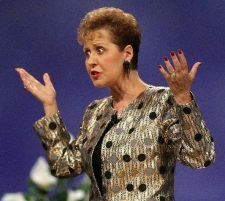 Over the past couple of week’s Joyce Meyer has been releasing tweets on Twitter to draw attention to the publication of her book. She has been promoting her book with colorful, but often inaccurate statements. One of those more theologically inept utterances was tweeted out on September 22nd. The shallowness of these 140 words pulls back the curtain and allows us to see one of the biggest lies in the Word of Faith theology and the movement itself — Self-Entitlement.